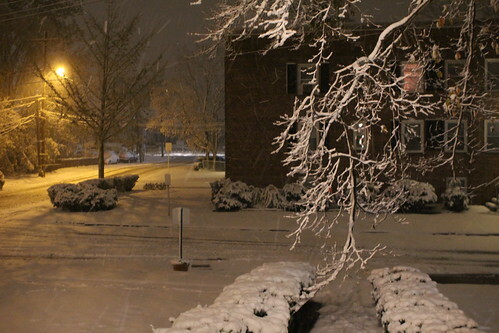 The Weather Channel had the bright idea to start naming winter storms starting this year. It seems like an odd move but people probably thought the same about hurricanes years ago. Lucky for us, a mere week after Hurricane Sandy, we got to get a visit from the very first winter storm of the season: Athena. While it hasn't amounted to a heck of a lot more than some snow so far the region is in a bit of a panic after the recent hurricane. So it was that every place started closing early and we got a call from the day care center to pick the boys up a few hours early this evening. 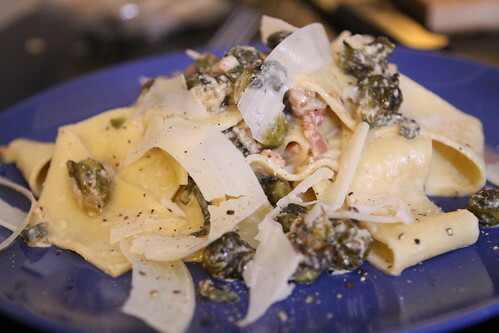 After getting them home I made a quick pasta with rendered bacon, garlic, onion, roasted Brussels sprouts, cream, and Parmigiano-Reggiano. I also cut some pasta sheets to make some pappardelle to serve it with along with fresh sage, salt, pepper, and a pat of butter. 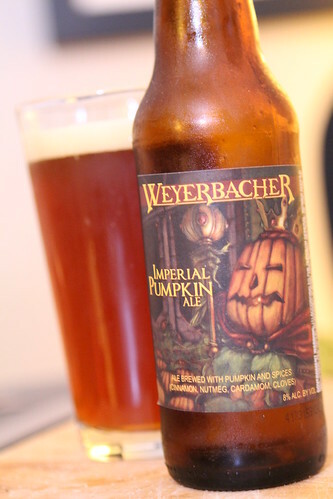 For beer tonight we had another Imperial Pumpkin, this time from Weyerbacher. It was a very nice beer and ranked somewhere in the middle of the pack of this year's pumpkin beers but towards the bottom of the Imperial Pumpkin variety. After dinner we continued with the Wombats' nightly routine, this time giving them baths in their new little tubs. Martin was not one hundred percent sold on the new bath. Elliott also tolerated the bath even though we had to wake him up from a deep sleep to give it to him. Luckily it only takes him a minute or two to get to sleep. Martin, on the other hand, has needed multiple hours at times with both me and Jen trading off in shifts to try to get him to settle down. Jen was the one who got him to sleep on Monday and yesterday I miraculously got him to sleep by turning off all the lights and rocking him with my left for about forty minutes. Somehow the addition of day care has seemed to add a tremendous amount of work to our daily routines. I'm hoping that once we get used to it it won't seem like quite so much. Until then we will simply continue to press on with this routine until one or both of us collapses from exhaustion. No, not the Lindsay Lohan style of exhaustion. Actual exhaustion.